A silly pic of David (l) and Mario (r) Before--AFTER!! I dreamt about Dave Smith last night…he looked like my brother Anthony did when I last saw him – he was still a “big” man but the ravages of his disease had caused him to lose 40+ pounds. 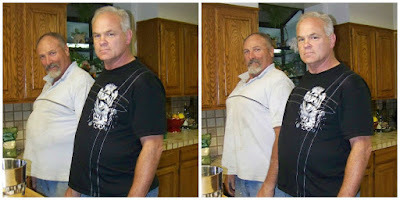 In my dream, Dave looked “different” – like about 170 pounds (! ), but, like Anthony, it was clearly Dave Smith. I was visiting a sick and dying Dave Smith, like he had cancer or something…but anyone who knew Dave knows that NOTHING bothered him. He might have been sick, but he was fully “Dave-like” in my dream…joking, not complaining, not responding to any physical pain...speaking in serious and affectionate words, then suddenly giving you a familiar tease! He even made fun of himself. It was so familiar. Bottom line – It was good to see him! I started to think, “…it was good to see him…it was good to see him! We’d come back from Africa maybe once a year (from 2006-2013), and Dave and his wife Terry would host us at their home as our USA travel “base” … they were often the first people we’d see when we got back to the USA, back to home. It was always good to see them. We’d catch up with “life” …it was like no time had passed. Last month I visited with my dear friend Russ Guiney in Los Angeles. We both started our Ranger/Peace Officer careers on the same day in 1977! We met at the Santa Cruz Mountains District Headquarters. We hadn’t seen each other since 1996, over 20 years! We both looked older, but our recent time together was rich…and fresh. It was a wonderful time of reconnection…and he’s still the same man I used to admire and look up to. I miss Dave Smith deeply. I decided to go on a brutal backpacking trip over this past 4th of July holiday weekend with some young men. Thankfully, Mike, a man my age, decided to go as well. I barely made it…I know I slowed the team down…but I managed to survive the trip. Why would did I agree to make such a trip? I went for one reason – in honor and remembrance of Dave Smith. My first “camping trip” with Dave and his family was in the summer of 1977. We made regular trips to the Mokelumne Wilderness until his sudden death last December. I awoke from my dream feeling like I’d had a wonderful time of “reconnecting” with Dave! I felt refreshed; we got to catch up…as if to know it would be awhile before our next time together. When we saw each other, it was like no time had passed – we “re-connected” in a moment. It was good to see him. 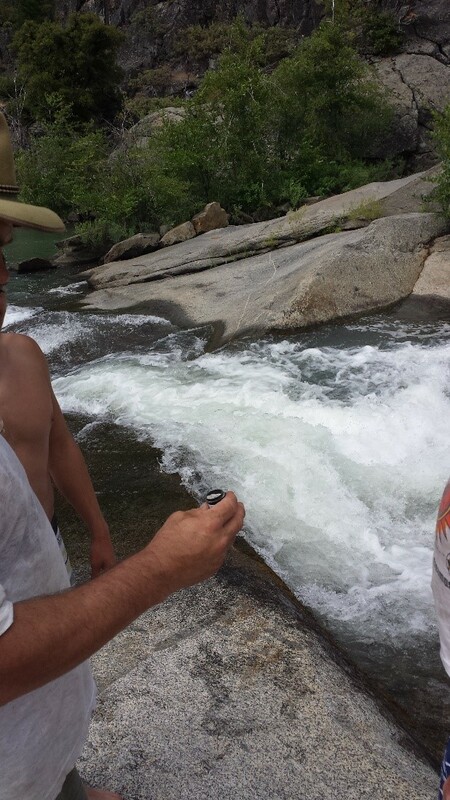 Dave, Elijah, and I putting some of Anthony’s ashes in the waterfalls above “Big Hole” in August 2014.